A group of extremist illegal Israeli colonists cut, Sunday, many old “Roman” olive trees in the garden of the Ibrahimi Mosque, in Hebron, in the southern part of the occupied West Bank. The head of the Public Relations office of the Waqf and Islamic Endowment Department in Hebron, Ra’ed Maswada, stated that the colonists were seen cutting the trees in the mosque’s garden, and that he informed the head of the department, Sheikh Ismael Abu al-Halawa, in addition to the director of the mosque, Hifthi Abu Sneina. The officials instantly contacted the related parties to stop the ongoing attack, before the Palestinian District Coordination office contacted its Israel’s counterpart, and eventually the assailants were stopped, but the Israeli army did not apprehend them. 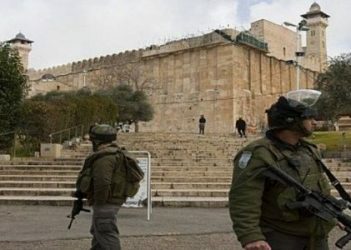 Maswada said that he, and his colleagues, demanded the army to act on preventing such violations, as the area is under full Israeli control, where soldiers are constantly present, especially in and near the illegal colonies and outposts, and around the holy site itself. The Ibrahimi mosque is considered one of the holy sites of Islam. February 2019 will mark the 25th anniversary of the Ibrahimi Mosque Massacre, when an Israeli settler opened fire at Muslims observing the dawn prayers on a Ramadan morning, killing 29 worshipers and injuring 150 others before he was caught and killed by the crowds. The settler, an American-Israeli physician identified as Barouch Goldstein, who resided in the ultra-fanatic Kiryat Arba settlement in Hebron, walked into the mosque as a large number of Muslim Ramadan worshippers, mainly elderly, were praying and opened fire at random from his Israeli army-issued machine gun leading to the large number of deaths and injuries. Immediately following the massacre, Israel decided to punish the victims by closing down the old town of Hebron, where the Ibrahimi mosque is located, for six months. An all-Israeli committee was formed to probe the massacre, instead of punishing the settlers, to divide the mosque between Muslims and Jews, and to close down several commercial streets, most famously Shuhada Street, which remains closed for Palestinians until today. Army checkpoints were also set up to restrict the movement of Palestinians, while Israeli settlers continued to move freely and without any restrictions. Twenty five years later, the mosque remains divided in half, with half of it for Muslim worshipers and the other half for Israeli settlers living on illegally colonized land in the Hebron area.